For more than a decade we have been Troy’s go-to tree service company. The quality we provide and our commitment to giving our clients top service is what fuels us to provide the best service they can ever have continuously. We are a full-service company that caters to our valued customers across Troy. Our excellent client reviews on Yelp, HomeAdvisor, and Angie’s List will prove you that we are what we say we are. Our specialty lies both on the basic and more elaborate tree maintenance such as removal and storm damage response. In everything we do, we make sure that you and your property’s safety is our top priority. From the beginning until the end of whatever task we perform, we thoroughly plan and think of the most effective approach to make sure we achieve the best results. We have certified arborists and other tree experts who have ample knowledge of how trees should be maintained. We know the needs of your trees, and we can provide these needs, so you don’t have to worry about anything and wait for us to finish the task. When we work on a project, we don’t only look at your tree, but we always consider your entire landscape. We value safety more than anything else that is why we make sure that we are licensed, bonded and insured. Our employees are provided with workers compensation, and you can be confident that while we are in your property, you will not be held responsible for anything. Our commitment to excellence is very evident with the equipment we use. 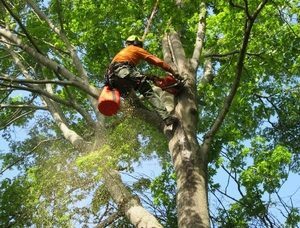 We don’t use just any kind of chainsaws, chippers, trucks, or grinders because we use only top of the class equipment to help us perform a tree removal, trimming, stump grinding, and other services with utmost efficiency and safety. We are aware that our valued clients have a choice when it comes to tree services. Other tree companies go door-to-door soliciting your business and promising too-good-to-be-true services. Don’t let yourself be cheated by these “companies” because most of them are con artists who only want your money. There are legitimate companies that can give you a type of service that is not too expensive but is of good quality- we are one of them. Whether it is a large-scale task or a simple tree trimming, don’t hesitate to call us because no tree project is too simple or too challenging for us. by all means. Overgrown trees are a threat to you and your property’s safety because there might be dead limbs and branches that you failed to notice. These branches can fall off your roofs and injure anyone in the vicinity. Another thing you should consider is your homeowner’s insurance coverage. If your tree is in contact with any part of your home, your damage claims will be void by the insurance provider. 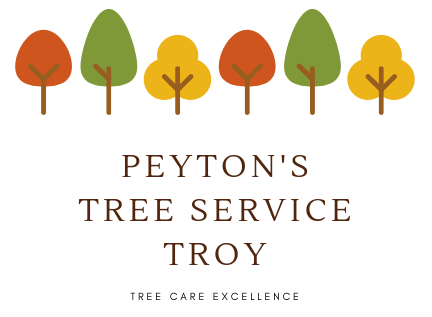 Whatever the reason for tree removal, Peyton’s Tree Service Troy will be able to perform the task correctly and efficiently. There can be challenges when performing tree removals such as the presence of nearby structures and power lines. It is precisely the reason why we never recommend our clients to do their tree removal. Let us handle everything for you to ensure that everything is done safely. Tree trimming is one of the most useful tools to keep your tree healthy and attractive. However, this aspect is mostly ignored by most homeowners thinking that their trees can thrive on its own. Don’t commit the same mistakes and have your trees trimmed regularly. It is essential for trees to be trimmed to maintain its symmetry and to ensure there are no overhanging branches on your property. Trimming may be a simple technique, but it goes a long way if done correctly. We will meet with you and asses the tree to be trimmed as well as discuss with you our approach in trimming. We will set a schedule for the work to be done and give you the written estimate with all the essential details of the task as well as our license and insurance documentation for your protection. As we finish tree trimming, we will make sure that the area surrounding your tree is cleared of any tree debris, limbs, and branches. After the procedure, you will be impressed with how we’re able to restore the beauty and safety of your property. Your yard will look more beautiful than ever. When we perform tree removal in your yard, it is natural that a stump will be left for you to deal with. Most of our clients opt to remove these stumps because they are generally eyesores and can also be dangerous. Stumps are hazardous because they can cause anyone, especially children playing in the yard to trip and be injured. 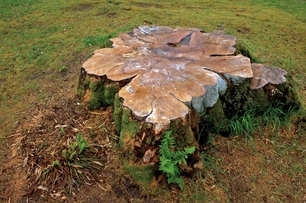 Stumps can also be home to many pests such as rodents, bees, and termites. Further, stumps that are left sitting in your yard can damage your mowers if you don’t notice them while doing your routine maintenance. Stumps should be removed regardless of the method you want us to use. As with our tree removal and trimming services, we will assess the stump to be removed and provide you with a firm quote, then set a date when we will finish the task. We will never leave your property until we are 100% sure you are satisfied with our service. You may think that stump grinding is a simple task and you can do it on your own provided you have a stump grinder. You may be surprised to find out otherwise. You need knowledge and proper execution to ensure the stump is correctly removed. At Peyton Tree Service, we will remove your stump fast and safely. A strong storm can affect the physical state the overall health of your trees. We have seen so many properties that have been devastated due to inclement weather, and that is precisely the reason why we committed ourselves to provide emergency tree response 24×7 throughout our service area. We know that felled trees, scattered limbs and branches, and downed power lines can slow anyone down, that is why we promise to respond as fast as we can as soon as we receive your call. We will help you clean the area of your home that is affected by the storm damage. We have all the necessary equipment needed to ensure your property will return to its original beauty and form. We have made several emergency tree response in the past years, and we already have more than enough experience to make sure your property will be restored of its former look. Dealing with downed power lines can be very dangerous, and we never recommend our clients to do it on their own. Give us a call, and we will promptly respond to your emergency tree damage needs. If you have small to large limbs and branches that you need to get rid of, you don’t have to look further because we can also offer it to you. We have chippers that can handle brush and wood up to 6″ in diameter. We can either put these wood chips away or stack them anywhere in your property.